Jen emailed me today to declare that she had smelled a great deal of hamburgers today and that she had a craving for hamburgers. I didn't really understand where she was all day that she was smelling a bunch of hamburgers. To the best of my knowledge she returned to her job after an extensive 17 days off and not to a new job peddling hamburgers. I only got home in time to spend five minutes cooking before I picked Jen up at the train. That's just enough time to heat a pan, toss in some garlic, onion, potato, and peppers, then get them almost to the sizzling stage before turning off the head and dashing out the door. 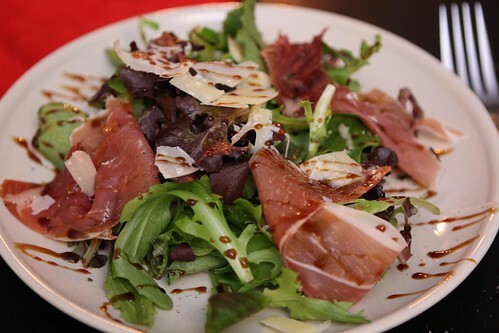 When Jen got home I put together some quick salad with greens, leftover La Quercia prosciutto from Jen's New Year's dinner, shaved Parmigiano-Reggiano, olive oil, and a little balsamic glaze I'd made a couple of months ago. This was enough to keep us from starving to death as I finished the main dinner. I briefly entertained the idea of making hamburgers but it would have required a lot of additional ingredients when we already had so much to clear out of the fridge and freezer. 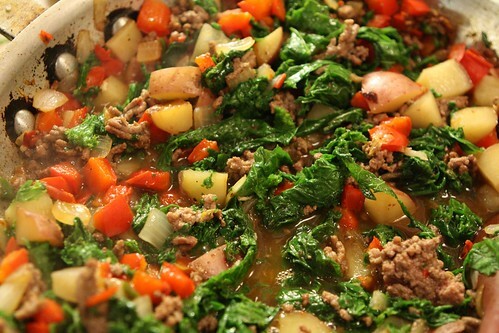 Instead I put the fire back on the pan, added some frozen ground beef (an ingredient in hamburgers, I am told), and then added some jalapeno, salt, pepper, hot sauce, and chopped mustard greens. 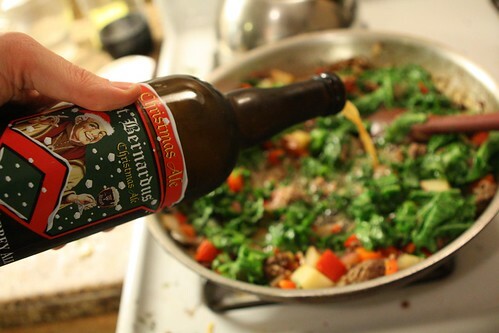 Since I had a little extra St. Bernardus Christmas Ale leftover I added that into the pot to cook down the stew. Some would say this is a waste of perfectly good Belgian Christmas ale, however . . .
. . . some probably also did not recive quite as many beer-themed presents for Christmas there year. I'd like to think that the smiling saint would approve. Jen said that she also had a craving for avocados. 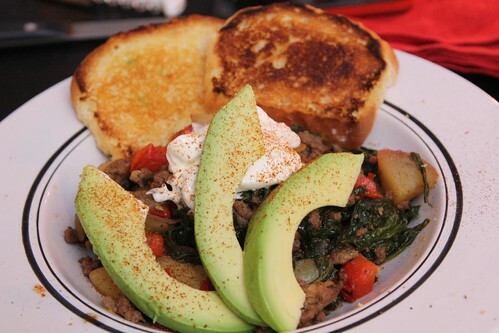 We both generally share this craving 100% of the time but since she actually mentioned it verbally I chose to add some to the stew with a little sour cream and some slices of her sweet roll loaf that I'd buttered and fried. I do love Christmas stews and dark winter ales so I paired this with one of my many Christmas presents, this Christmas Ale from Bell's Brewery in Michigan. 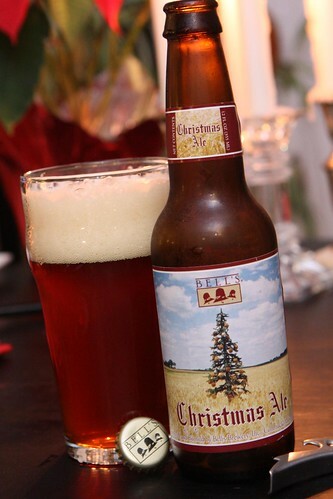 It was a very nice Christmas beer, dark, mildly spiced, and piney from the West coast hops used in its brewing. One would imagine a piney hop aroma to be perfect for a Christmas beer, like you have swept up all the needles under the tree and thrown them into the mash tun. This particular drink was a present from my sister-in-law and brother-in-law. I also got to enjoy it in a nonic glass that Jen got me for Christmas. Jen, aside from having a hankering for some hamburgers, also recognized that I have been struggling with only twenty-some-odd different glasses to enjoy beer from. This just could not be allowed to stand. This is why I married her. 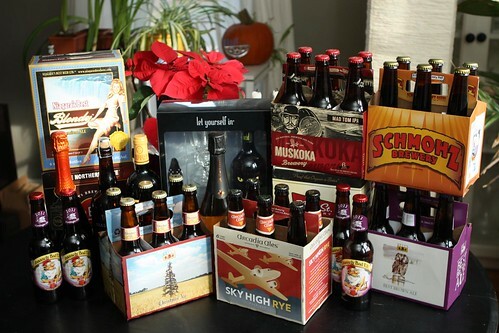 Is that a couple of bottles of tghe Elf beer in see in the Xmas loot photo? It's a total of four to be precise.